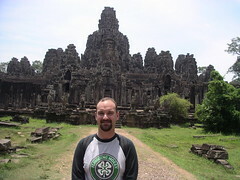 Bayon Temple was another spectacular place. It looks like a pile of rocks from a distance, but is covered in beautiful carvings and statues. There are 216 GIANT faces carved into the towers that either depict a Hindu god or the king who built it, depending on who you ask. Legend has it that the temple was originally covered in gold.